Slice pork tenderloin into 1-inch thick rounds, should yield approximately 12 pieces. Place one round between two pieces of wax paper. Pound with a flat meat tenderizer until very thin. Repeat with each round of pork. Place cornmeal and flour in a shallow bowl and stir to combine. Whisk egg and place in a separate shallow bowl. Add milk to egg and stir to combine. Dredge one tenderloin in the milk mixture, then coat with the cornmeal mixture and set aside. Repeat until all pork tenderloins are breaded. Heat oil in a large non-stick skillet. 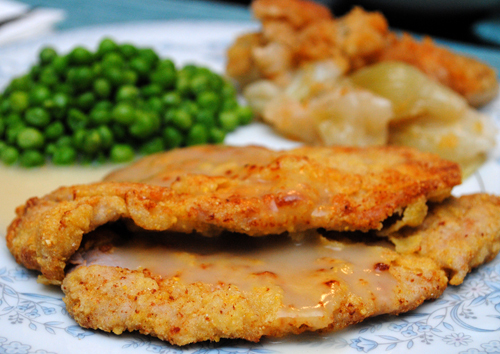 Place breaded tenderloins in skillet and cook for 2 to 3 minutes on each side until browned. Transfer to a plate lined with paper towels. Transfer to a plate lined with paper towels. Serve 2 warm tenderloins per person. Top with gravy.